Almost a year ago to the day, President Obama vowed to bring back nuclear energy in the US. Sure, it sounds like a great idea- it burns cleaner than fossil fuels, would promote domestic job growth, and would surely decrease our dependence on oil from the Middle East. But since then, what have we seen? Zip. Zilch. Nada. We seem to have leaped clear over nuclear energy in pursuit of harnessing greater wind and solar energy, but nuclear energy manages to thrive despite its detractors. Even though the U.S. seems to be over the idea of a ‘nuclear renaissance,’ other countries, particularly those in Asia are moving ahead with the construction of nuclear reactors. 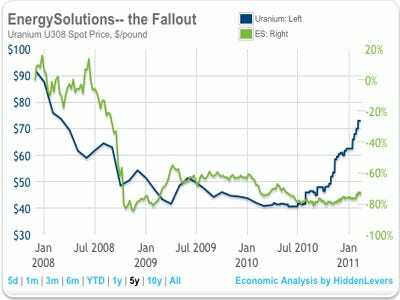 Nuclear energy, while still important in the here seems to have much bigger growth prospects overseas, which looks to be the saving grace of this energy commodity. 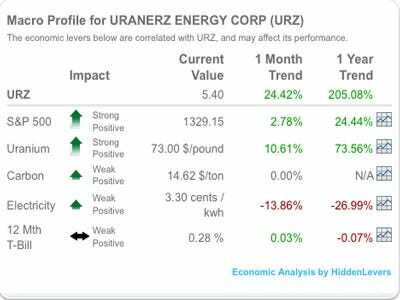 They trend very closely to Uranium, so as long as there is demand and the price of Uranium goes up, we are comfortable in our belief that these two companies will follow suit. 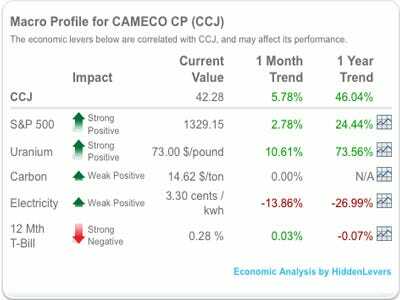 Be on the right side of well-performing commodities- macroanalytics help you make good investment decisions! This post originally appeared at HiddenLevers.